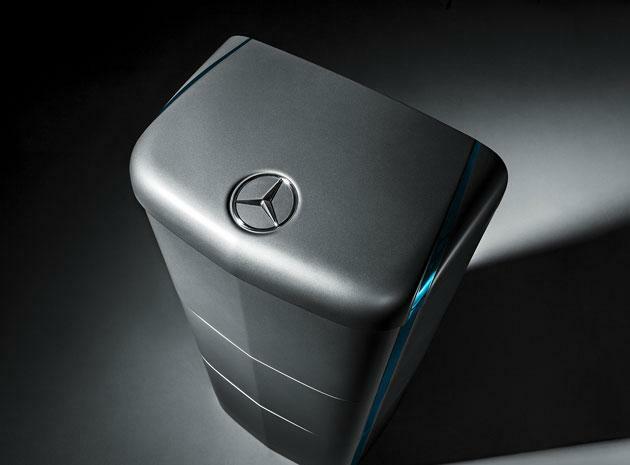 Tesla’s Home Battery gets competition from Mercedes-Benz. Image source. Mercedes Benz Australia plans to unveil the home battery storage offering at its Melbourne headquarters in Mulgrave, along with an on-site four-car charging station, made up of the lithium-ion battery packs and solar panels. The plan is for the company to sell the batteries to customers as a package with rooftop solar – the cost per 2.5kWh battery unit has not yet been released – through an as-yet unnamed “electricity retailer” partner. According to Mercedes Benz German parent company, Daimler, up to eight 2.5kWh modules can be combined to make a capacity of up to 20kWh, allowing solar households to “buffer surplus… power with virtually no losses,” and increase their self-consumption to as much as 65 per cent. The batteries have been available on the German market – where they are also sold as packages with solar by a network of sales partners – since April of this year, and according to the website have generated “tremendous interest” and numerous orders. The move into the Australian residential energy storage market, says Mercedes head of corporate communications David McCarthy, is a natural progression, and goes hand in hand with the roll-out of electric cars: Mercedes is releasing three new plug-in hybrid EV models in Australia in July. It also puts Mercedes into direct competition with fellow prestige EV maker, Tesla, whose 7kWh Powerwall battery was released to much fanfare in Australia in December last year. In terms of demand for the Mercedes home battery, McCarthy said that the level of interest being shown in Australia indicated they might move a few hundred a year, but that it was “unchartered territory”, so difficult to predict. As for EV demand, McCarthy concedes that numbers are still small in Australia, and will take a while yet to build, but that stationary storage will help move this along. “It will take a while… for EVS to sell in greater numbers,’ McCarthy told One Step. “Incentives are only one of the issues …and where the power comes from that charges the cars is another – and this is our solution to that problem.